blog.HalloweenAdventure.com | Latest News from the Costumes Trend FrontLines! : Indiana Jones Style! Dr. Henry Walton, esteemed professor of Archaeology, is a superhero in his own right. And he’d better be, after multiple movies and portrayals of his character by everyone from Harrison Ford to River Phoenix. You’ve probably seen the most recent Jones film, which starred up and coming Hollywood gangbuster Shia LeBouf, so why not recreate the great adventurer this Halloween? 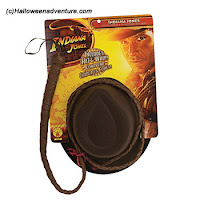 Our Indiana Jones Hat and Whip Set is made for foraging through mountain ranges and saving the day. It’s the perfect compliment to our Indiana Jones Deluxe Movie Adult Costume. Get ready for an exciting archaeological adventure! This officially licensed Indiana Jones costume includes the pants and jacket as shown. Escape danger and win the hearts of beautiful women in style! We also carry a more basic costume, one more fit for chasing bad guys under ground and not worrying about the extra baggage you have to carry. 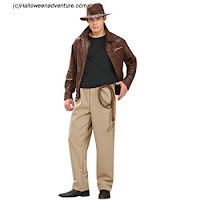 Our Indiana Jones Adult Movie Costume includes a khaki-color shirt with the Indiana Jones logo, brown pants, and a brown fedora-style hat with the Indiana Jones logo. Boys can get in on the fun with our Indiana Jones Children’s Movie Costume. 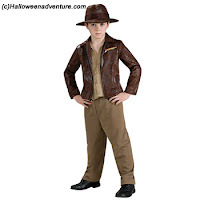 Fit for the youngest foragers, this costume includes a khaki-color shirt with the Indiana Jones logo, brown pants, and a brown fedora-style hat with the Indiana Jones logo. If you’re looking for a costume that’s bound to outlast the ages, try our Indiana Jones Children’s Deluxe Costume. Costume includes Jacket with attached shirt, pants and hat. Try a father/son costume and go as a Jones duo, much like the recent film starring LeBouf and Ford. For more costume ideas, log onto Halloween Adventures! Remember, time is running out! Halloween is in less than two weeks! Don’t let the days slip away without getting that perfect costume.